I like cauliflower, but I often have a couple of problems with it. Number one, when it is not in season it can be quite expensive to get a fresh head of cauliflower around here. I usually have to wait until it goes on sale someplace before I pick some up. The second problem I have is that by itself it can be quite bland. If you have ever steamed cauliflower or boiled it you know that it doesn’t always have a lot of flavor to it by itself and a lot of people get put off just by the smell of cauliflower as it is cooking. One of the reasons I do not often buy frozen cauliflower is that it can be pretty tasteless in my opinion unless you do something with it. So when I bought some fresh cauliflower last week, I set out to try to find a good way of cooking it. I love roasting vegetables myself; it brings out much more flavor and you get the chance to add some herbs, dressings or sauces to it to make it even more flavorful. This works particularly well with cauliflower, so I was glad when I found this recipe from Bon Appetit for roasted cauliflower with lemon-parsley dressing and decided to give it a try. Preheat the oven to 425 degrees. Toss the cauliflower florets and 4 tablespoons of the olive oil on a rimmed baking sheet; season the cauliflower with salt and pepper. Roast the cauliflower, tossing it occasionally, until it is tender and golden brown, about 25–30 minutes. Meanwhile, pulse the parsley, the lemon juice, and the remaining 2 tablespoons of the olive oil in a food processor until it is very finely chopped; season the dressing with salt and pepper to taste. 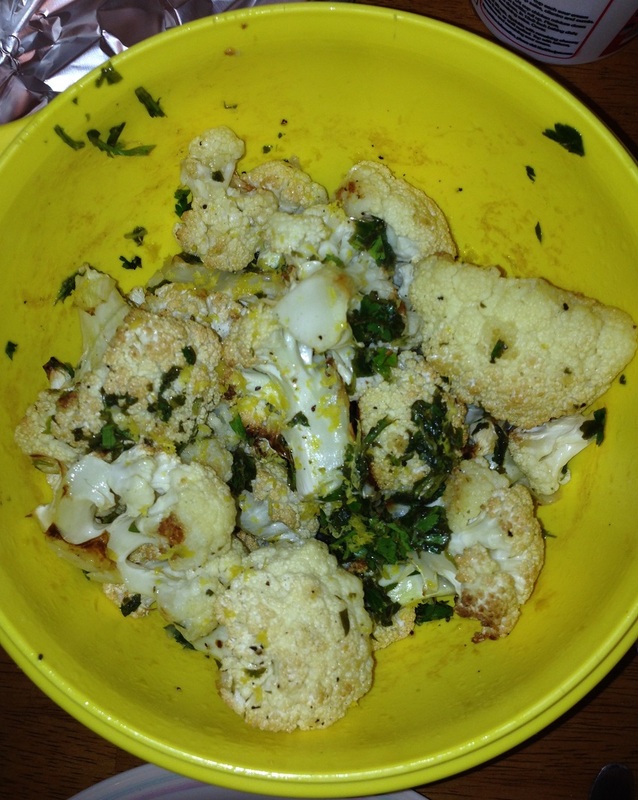 Toss the roasted cauliflower with the lemon-parsley mixture and top the cauliflower with the lemon zest. It is a very simple side dish that really gets the flavors of the cauliflower brought out by the roasting. The lemon dressing really helps to bring it all together as well. You can use this as a side dish for really any type of entrée you are making, such as steak, lamb, chicken or pork. I used it as a side when I made the molasses-glazed pork tenderloin I had made and it went perfectly with the meal. You can also make the dressing ahead of time since it is easy to put together and keep it chilled in the refrigerator until after you have roasted the cauliflower. it makes for a great option for you if you are tired of steaming or boiling. That’s all I have for today. Check back next time for another recipe. I just want to take a quick moment to thank everyone who has been following along or reading the blog as it continues to grow. it has been a lot of fun for me and I hope you can find some great recipes that you want to try for you and your family. If there is ever anything that you want to see, a question you may have or a recipe of your own you would like to share, please feel free to leave a comment below, send me an e-mail at IguanaFlats@msn.com or catch up to me on my Facebook or Twitter page. Until next time, enjoy the rest of your day and enjoy your meal!